Unlock the magical capital of New South Wales with a motorhome to hire in Sydney, Australia. Hiring a camper van is the ideal way to experience this cosmopolitan city and the activity-filled surrounding area. Take in the stunning sights of Sydney harbour including iconic Sydney Harbour Bridge and Opera House. Sydney’s many campervan parks boast some of the best camping facilities in Australia, with much to offer for both kids and adults. Sydney is one of the most easy going and friendly cities in the world, a place dedicated to sun, sand and sea. A self-drive camper van holiday is a fantastic way to see Sydney’s metropolitan centre and the national parks, bays and beaches of the coastal regions. Choosing to hire a vw camper van for your holiday in Sydney gives you complete flexibility to discover this wonderful region at your own pace. Some of the stand-out sights are the crisp sand and blue sea of world famous Bondi Beach, and the spectacular sandstone peaks of the Blue Mountains. Others include the Royal Botanic Gardens and Hyde Park. 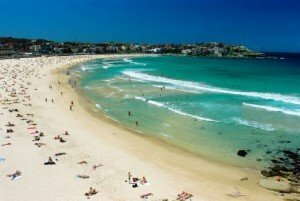 With campervan hire in Sydney there is no need to limit yourself in choosing what to see and do. Just west of Sydney you can take in magnificent waterfalls and the rock formations of The Three Sisters. New South Wales also offers Australia’s oldest wine producing area, the Hunter Region, with a host of wineries and great places to eat for food aficionados. In a region renowned for its natural beauty, with golden beaches, subtropical rainforests and snow capped mountains, campervan hire Sydney offers a unique opportunity to get as close as possible to magical wildlife and awe inspiring scenery. Campervan hire offers an unrivalled level of comfort as you are able to explore Sydney taking your accommodation with you. It is also one of the most economical ways to travel: you don’t have to think about the hassle and expense of booking and finding your way to hotels every night. With a hired camper, your only obstacle is the open road. Park up in the mountains overlooking the city, and wake up surrounded by flora and fauna. Whether you are taking a family holiday or setting out for break with a group of friends, a campervan holiday in Sydney gives you complete flexibility to combine relaxation and adventure. You can choose to spend a day visiting the stunning scenery around Sydney, or feeding koalas, kangaroos and dingoes at the Featherdale Wildlife Park. Alternatively, leave your camper behind for a day to take a boat out across Sydney harbour or a short cruise on the Parramatta River. There’s plenty of adventure in Sydney, and when you are hiring a motorhome everything is accessible: sailing and surf boarding at Bondi Beach, sky walking on Sydney Tower, sea plane flights at Palm Beach. If you’re feeling in need of pure relaxation, there’s nothing better than to chill out in one of the green and spacious camper van parks with deckchairs and a barbecue. 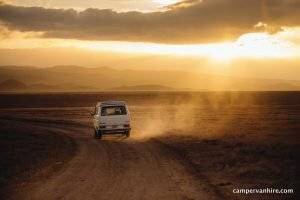 Campervan hire in Sydney makes for a holiday to remember.